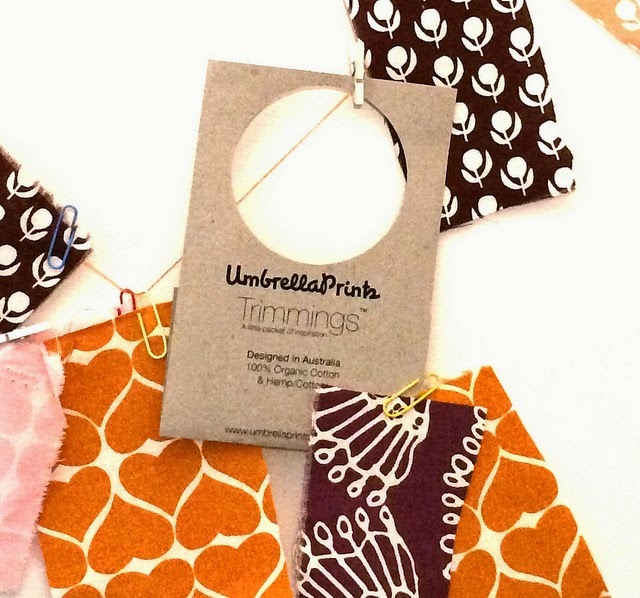 Some of you may have noticed these brown packets of fabrics floating around blogland, but for those who haven't seen them before Umbrella Prints is an Australian company that produces organic printed fabrics for home decor, clothing and quilting. Amy and Carly do a wonderful job of designing contemporary yet timeless fabrics. Each year, well, for the last 4 years, they run a competition to create something from a packet of their fabric trimmings. Somehow I always seem to find out after the competition has finished but this time I bought my Trimmings in time to join the fun. One of the conditions of the competition is to take a photo of the fabrics with the signature packaging, the brown paper with it's round window. Easy - I just took a photo when the postie ducks delivered the fabrics. I let ideas brew for a while before coming up with The Big Idea. 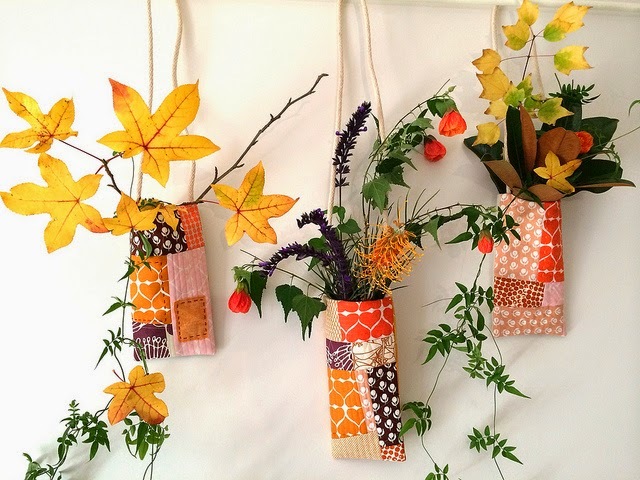 It came to me when I noticed the fabrics matched the autumn colours of the garden. 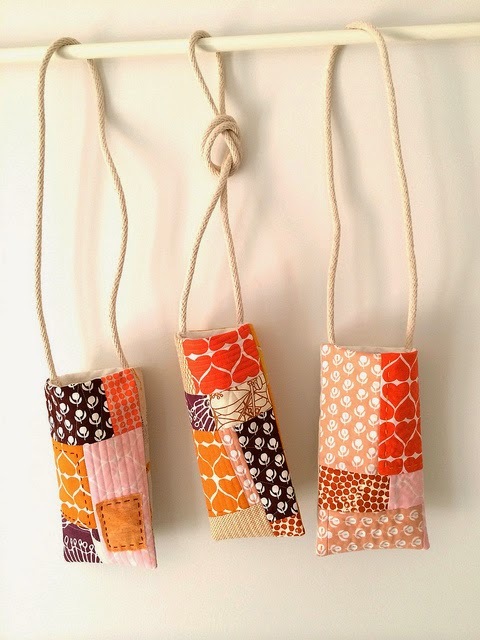 I laid my pieces out in 3 designs and sewed them into patchy rectangles. I then quilted the panels to add decoration and stiffen them up a bit. 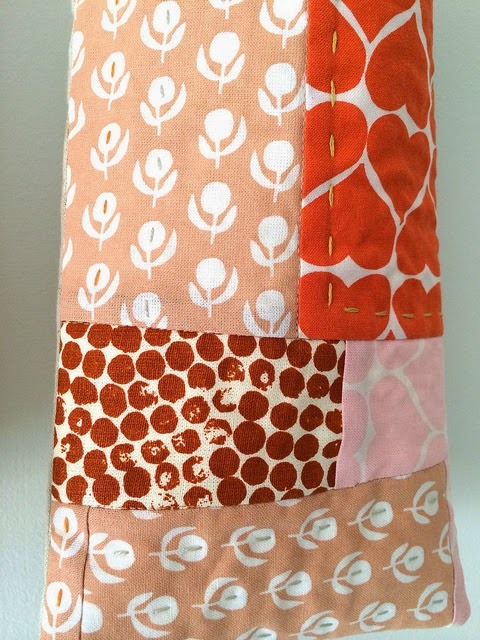 I used a mixture of hand quilting. I added a panel of linen to the back and then lined them in white cotton. Soon I had three bags. I didn't design them to be bags. 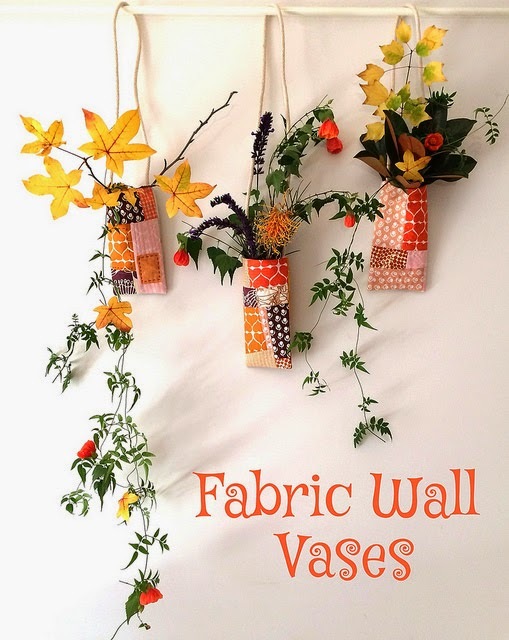 They became Fabric Wall Vases!!! The colours are a perfect match for the foliage and flowers from the garden . 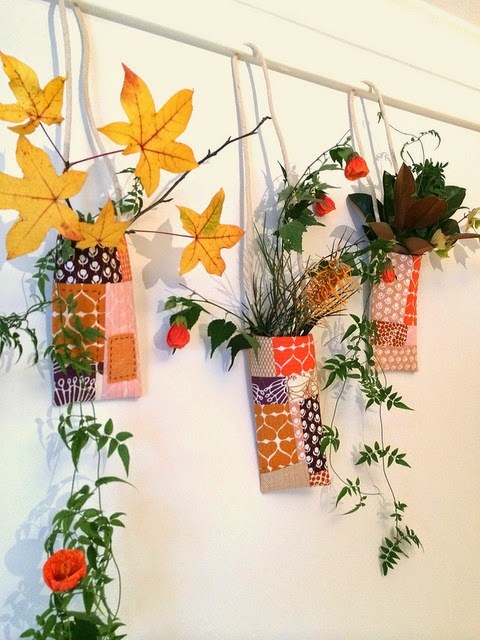 These Fabric Wall Vases just make me happy!! If the Wild Autumn Garden look isn't your thing. The Knotted Column of Tropical Birds style looks quite good too. 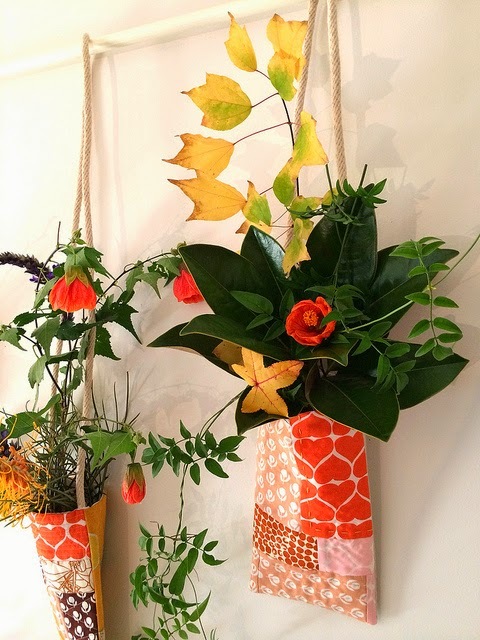 I'm looking forward to seeing what other flowery configurations these vases will inspire. 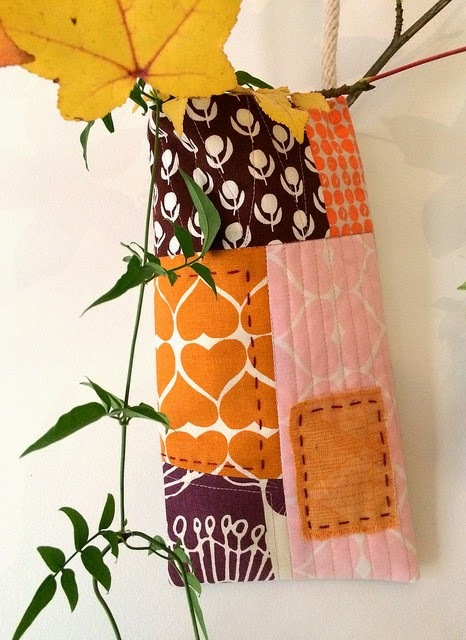 I might just have to have Fabric Wall Vase updates every now and then. I can see why they make you happy - they look amazing, whether in use of waiting to be used. Very creative! Very clever idea, Rachael. Your vases look fantastic!!! These are absolutely fantastic Rachael! Very clever and extremely original. I want to try these! Your wild autumn garden look is so pretty! I love the foliage you've added to the vases and flowers. I have never heard of Umbrella Prints! I love the fabric you were sent (and laughed heartily when I read/saw your postal ducks!). 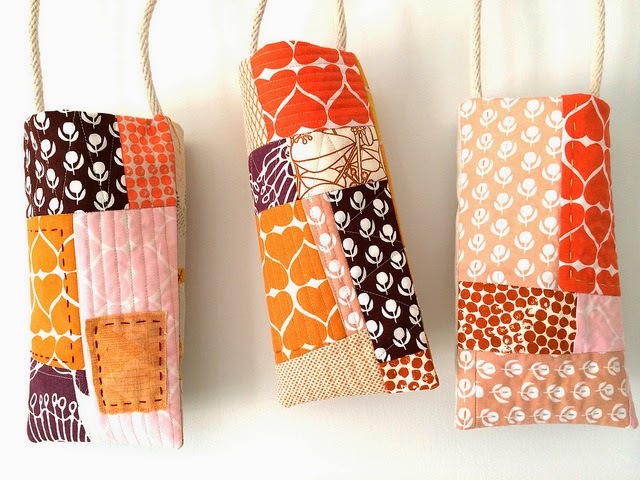 There is such suspense in this post - I thought you had made some beautiful bags (perhaps for holding items such as keys or other bits that end up on the end of a bench in our house!). But wait - there's more. Beautiful wall vases! So clever!! I love that these look fantastic but are also so practical (i.e. 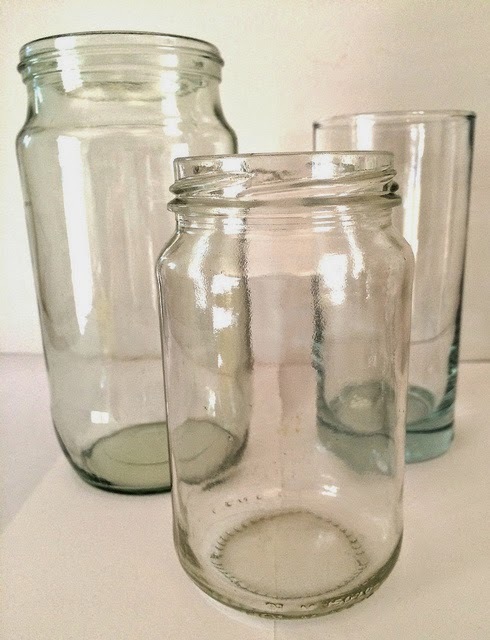 take out the jars to wash). 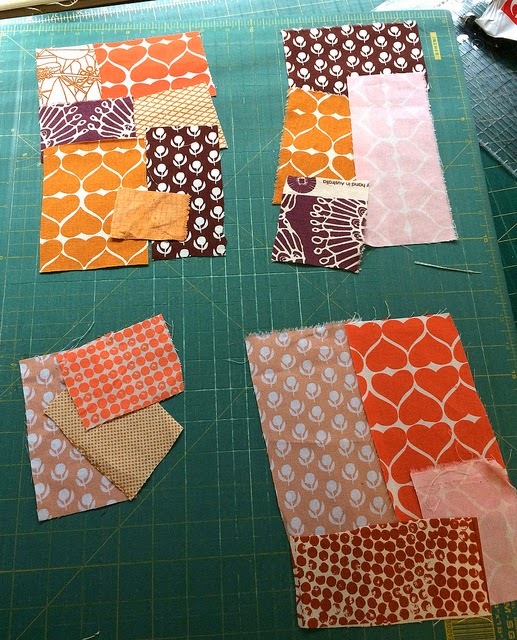 The perle cotton quilting is becoming a bit of a signature for you. Zoe and I were talking just half an hour ago about how her next project should include some perle cotton quilting 'like Rachael Daisy'! Oh my gosh they look so beautiful! What a fabulous idea! The prints are so pretty! A very creative use of those beautifully colored fabric trimmings. Hmmm, that's something a florist might think of ! I cant imagine that there will be a more creative entry that this Rachael. Genius! They have a bit of an Aboriginal dilly bag about them. I think it is the shape and the ochre colours. You are amazing! Wall vases toooo cute, arrangements in them fabulous! Huge smile on my face as I look out at my strelitzia bush! Make you happy, make me happy, just happy happy... U r the cleverest best!! Absolutely brilliant! So artistic. Love your floral arrangements and the variety of ways of displaying them. Hope you win the competition. Another inspirational make, Rachael! This is SO clever! I think we will be seeing these popping up in design magazines before long! And I love the Autumn leaves too! So beautiful! I've made something out of this bundle too. I can't wait to see them all! 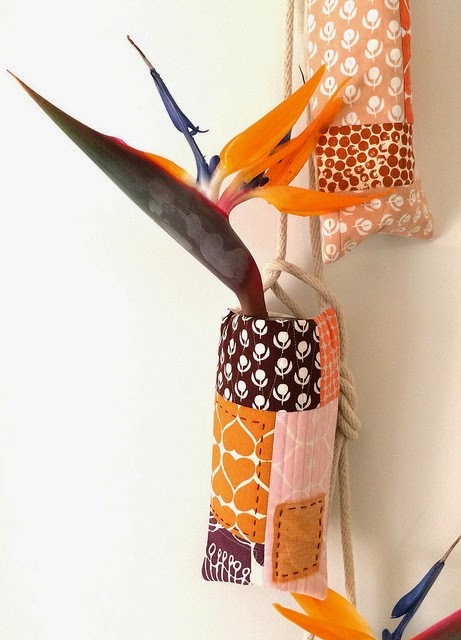 I like the stitching that you did and how creative is that to turn the small bits of fabric into fabric vases? Nice! Just been to the Umbrella Prints site - they do have prizes!! I'll be voting for you! Wonderful! You always come up with the most clever ideas. Your expert floral arrangements really add to the ambiance. Bravo X 3! WOW!WOW!WOW Rachael - Your vases are FABULOUS!! 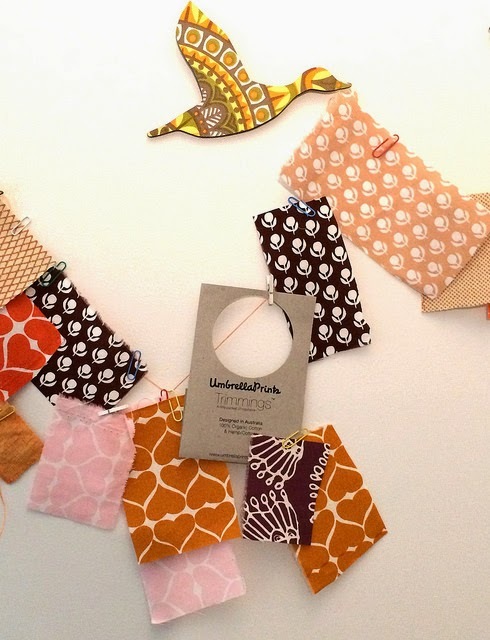 Great idea.... with great fabrics! 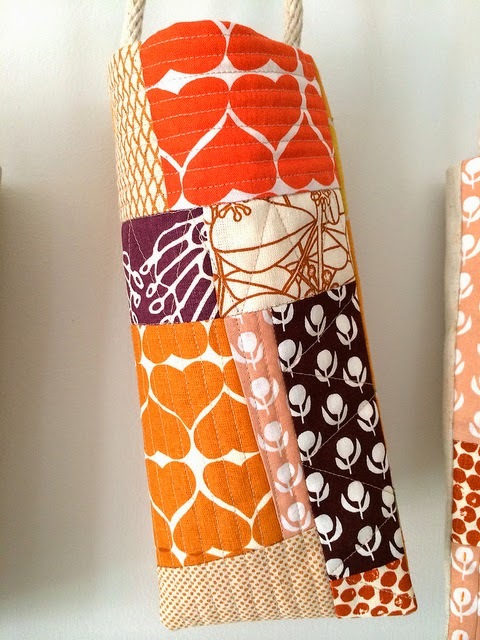 What a creative way to use those fabrics. Another very creative idea Rachael. It's always a delight to read each blog post, as I know I'm going to see something really creative that pretty much always makes me say wow. So cute, what a great idea! I love those Birds of Paradise. I adore both the quilted jar covers And the flowers and vines you found too! Pretty, pretty, pretty! 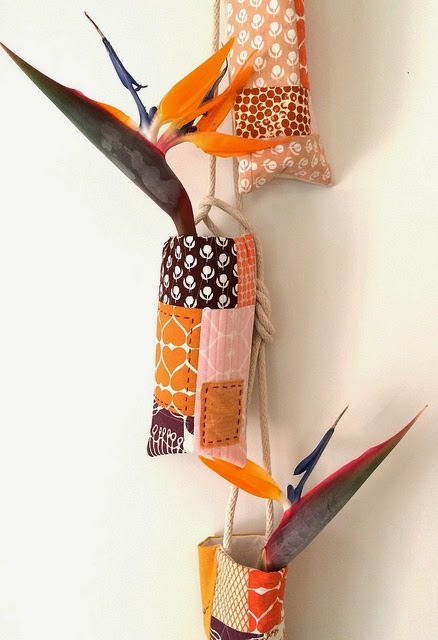 These little hanging jars sure would brighten up a room, especially with your glorious foliage. Delicious! Unique and beautiful bag, wish I had some of your flowers. A perfect match (the bags and flowers). Aren't you absolutely the most clever girl! I love these! Gosh you are good! What a fabulous idea and use of the trimmings. 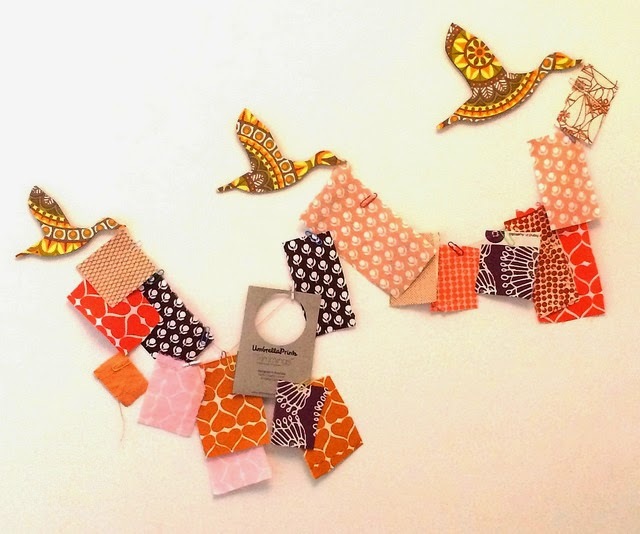 I love the bunting hanging off the birds. It looks like they are carrying it around in the sky for everyone to see. 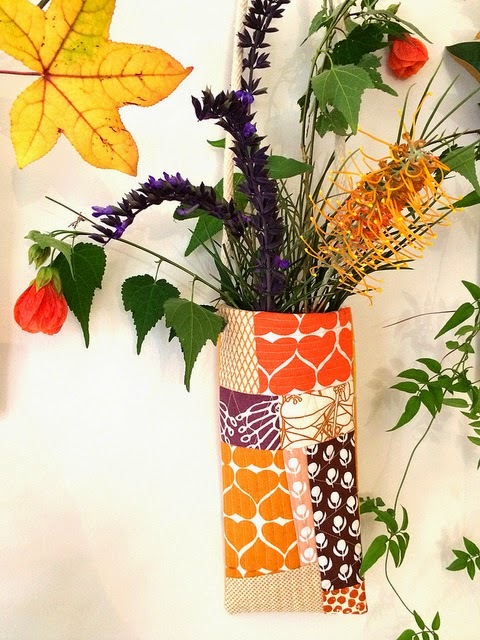 Your day job skills make a good contribution to the wonderful quilty vases. I sure wish I had your creativity--could you loan it out please, like maybe for a month or so? How wonderful!! 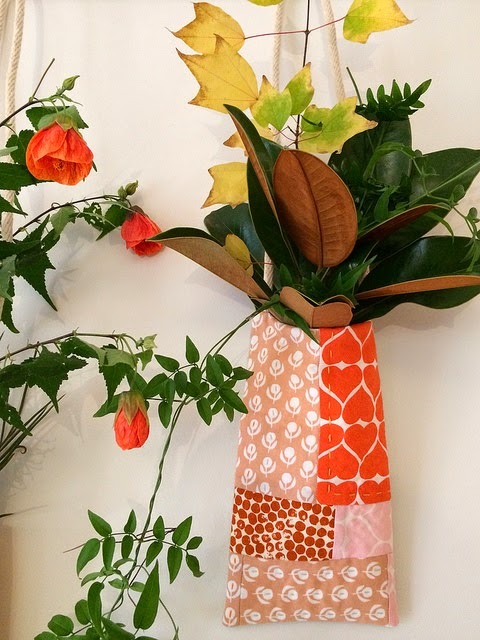 Making these bags as vase holders works so well. Very creative and modern! And I have to say that you have the most amazing foliage, too.